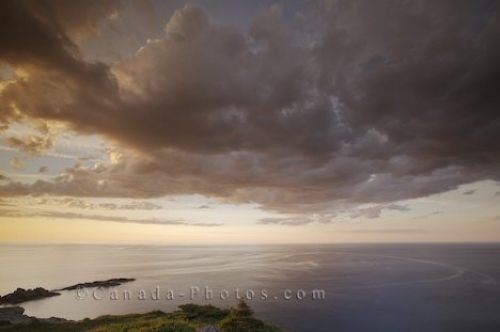 The cloud cover which has moved in over Notre Dame Bay in Twillingate, Newfoundland Labrador creates a beautiful scenic picture as the sunset lighting alters the hues of the clouds. The surface of the water makes up its own pattern as the colors reflect across the water and onto the rocky shoreline. Coastal scenery seen from just below the Twillingate Long Point Lighthouse, Twillingate, Road to the Isles, Highway 340, North Twillingate Island, Notre Dame Bay, Newfoundland, Newfoundland Labrador, Canada. Picture of a sunset over Twillingate in Newfoundland Labrador as the cloud cover lingers over the bay.